Negritos, natives of the Philippine islands, usually classed with Papuans. 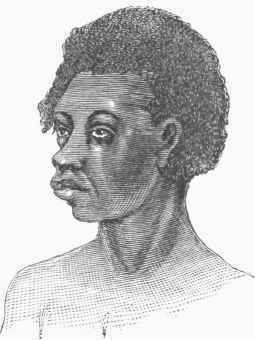 They in a measure represent the people called negrillos by Dr. Pickering in his " Races of Men " (1848), where he classes them as a subdivision of the Papuan race, and of the melanic or black family of mankind. They were formerly in possession of the entire group of islands, but are now found only in the mountainous districts of some of them, and especially in the northern portion of Luzon, where they inhabit also the coast from Palanan to Cabo Engano. (Semper, Die Phi-lippinen und ihre Bewohner, Würzburg, 1869.) Fr. Müller in his Allgemeine Ethnographie (Vienna, 1873) classifies them among the Papuans of the pure type, while A. R. Wallace considers them a totally distinct race, and, connecting them with the inhabitants of the Andaman islands in the bay of Bengal, is of opinion that they are probably of Asiatic rather than Polynesian origin; and Peschel in his Völkerkunde (2d ed., Leipsic, 1875) prefers to call them Asiatic Papuans, in distinction from Australian Papuans. In common with the latter, they have woolly hair and a fiat nose, broad at the base. They are not black, but of a dark copper color. The lips are somewhat puffed, and the jaws are slightly projecting. Virchow's measurements of some skulls have led to the supposition that their compressed form is of artificial origin. (See Papuan Race and Languages).